Where can Grey Whales be found in Canada?. Do you know the Northwest Coast? Do you know her many histories? Do you know the Northwest Coast? Do you know her people? Do you know the Northwest Coast? Do you know the many faces of her beauty? I first visited the Northwest coast of the Pacific when I was 18. It was a riveting experience, and one which drew me back not long after. I have lived on the Northwest coast now for more than 20 years. There is nowhere else in the world I’d rather be. I love walking the lonely beaches, watching for the pods of orcas flash by our bay, or for the bald eagle extravaganza that accompanies the yearly salmon run. I love exploring the tidepools, and continually finding new treasures. Learning about the plants and animals that share this place along with me is a constant wonder. With her sky-to-sea, snow-crowned mountains, jewel-like islands, stunning vistas, old-growth forests, and wealth of history, there is always something new to discover. 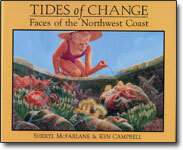 I hope that Tides of Change inspires you to look a little closer at this most wonderful of places. Published by Orca Books: Victoria, 1995.